How to Upgrade Firmware for Access Points with DWC-1000? How to Upgrade Firmware for Access Points with DWC‑1000? Once downloaded the firmware(s) you need, please put this file into the root folder of the tftp server. With regards to the above screen shot, the “Current Directory” has been set to. C\Program Files\Tftpd64, you must also select the IP of where the tftp Server resides on. In this example it is 192.168.1.169. Step 2 – Access the web GUI of the DWC-1000. 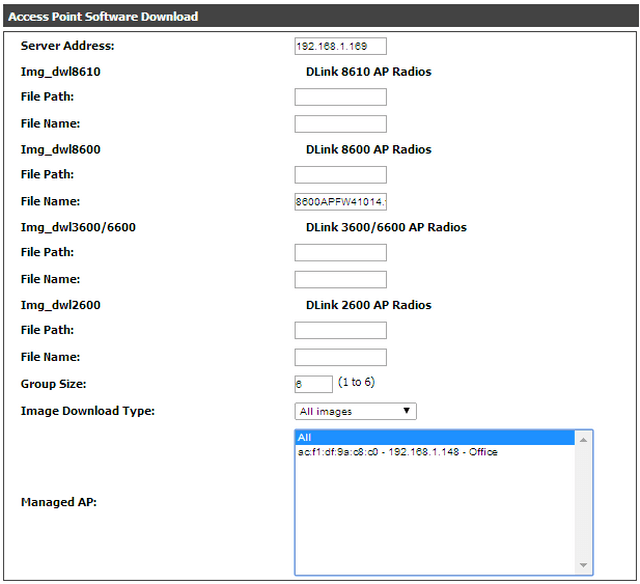 Step 3 – Go to Setup > AP Management > Software Download. Step 4 – Here you will see there are separate sections for each AP Model to upgrade their corresponding firmware. Server Address: Insert the IP address of the PC where the TFTP reside on. File Path: This related to where the firmware is located on the TFTP, here you do not need to write nothing. File Name: Insert the FULL name and extension of the firmware. Group Size: The DWC-1000 is able to update up to 6 access-points at one single time. If you have more than 6, you must repeat this process. Image Download Type: Select the model or various models depending which you would like to upgrade. Managed AP: Here will show the access-points to be upgrades. Please remember, the update may take from 10 to 12 minutes. Once clicked, you will expect to see the following progress page. You should also notice the tftp server will show the transfer file in progress. Once the process has been complete you should see the following “Success” message. Please note, for some reason you get an “Error” message, please ensure the TFTP Server isn’t blocked by either the Firewall or Antivirus program.